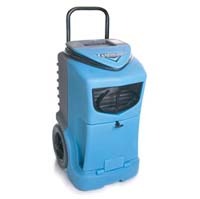 The Dri-eAZ dehumidifier combines proven design with professional performance and portability. The rotomolded polyethylene housing is dent resistant, offers superior durability, and helps to protect furnishings when in use. Stack up to two units high for storage. A rigid handle and semi-pneumatic wheels ensure easy transport and maneuverability.